Much of the art that is trending today is a mix of many mediums. The fresh new look is very appealing and I love the energy that it creates. It is normal to see change in our decorative painting world and watch how fads evolve. We live life in the fast lane which has a huge impact on fashion and art. Years ago, we had time to study, practice and learn strokework, color theory and composition. Often it took weeks, blood, sweat and tears to create a single project. Each project was a labor of love and a work of art! As the years progressed, the tools, mediums and techniques were introduced to make our painting lives easier. Instead of relying on practice and talent, we were offered new ways to achieve amazing results. These wonderful tools were shunned at first and dubbed as “cheating”. Remember the introduction of stencils into the “painting world? Those who admitted they used stencils were referred to as “lazy or untalented”. Now the resources that are available are overwhelming. Not only can we use a multitude of mediums, we can combine them as well. Instead of painting a rose, we can find a beautiful one and decoupage it! Image Transfer allow us to create beautifully lettered words without stress. Stamps offer infinite and intricate variety. We can add dimension, use markers, pens and even add fabric or cardboard. No longer are we restricted to those rigid rules. I love the freedom that today’s art provides. It has taken a long time to allow myself to admit that I can’t paint a round circle. I DO use stencils and I DO admit it! I hate spending time working on lettering only to find out it still looks awful! With awesome tools and tricks, I can paint and create faster; and the results look better. This allows me to spend more time creating and designing, which I love to do. If you are a traditional painter, I would encourage you to let your hair down, spread your wings and prepare yourself for a fun adventure. Art is all about expression and creating. So, no matter if you are super talented, or if you can’t paint a straight line, if you have creativity, you can make art! Art is color, composition, interest and expression. Have fun, play and watch this amazing journey! This entry was posted in Artists, Painting, Stuff that makes me smile..., Uncategorized on February 21, 2017 by Chris. 2017 is here and it’s time for fresh starts, new beginnings, trying something different, organizing, creating, and accomplishing many new and exciting projects! To help you celebrate, Cupboard Distributing is offering a fantastic Media kit by DecoArt. This fabulous kit will help get those creative juices flowing and help kick off your new year with pizzazz, bamm, pow and wow!! Liquid Glass will give crystal clear dimension. Perfect topping for berries, bubbles, eyeballs, dragonfly wings, etc…and with the precise tip, wonderful for adding texture. Matte Medium, I call it Magic Medium! I use it for a varnish, decoupage, glazing medium, it is my most used “go to” jar! Quinacridone colors are rich, saturated color that explode on contact! The Media Fluid Acrylics can be used in conjunction with regular acrylics, which means they will totally ramp up highlights to a new level. Plus, I love saying the name!!! Ultra Matte Varnish has the same sheen as acrylic paint. I can varnish the surface to protect (I call this my safety net) and when dry, I can go back and paint on OR drybrush with excellent results! Who wouldn’t want this fantastic set of pure inspiration. Remember to comment, like and share to enter! Contest starts Jan 15th and continues through the 21st. This entry was posted in Artists, Painting, Products, Stuff that makes me smile..., Uncategorized on January 17, 2017 by Chris. Remember when your Mom used to constantly tell you to “pick it up”, “put it away”, “clean up your mess”? Well, if you want to be more productive in your studio…listen to Mom!! How many times do we start painting with a large, clean working area and, as the project progresses, the working space somehow diminishes? That large open table, is now a small space that hardly allows room for the project! We all want to make the most of our painting time. I have found that following a simple routine makes a world of difference. If you follow these simple steps, you will keep your space open and your painting time will be a happier time. Step One: The first step, and probably the most important, in keeping a productive workspace is before the paintbrushes even hit the water is to start with a clutter free space. Before you get out the paints, brushes and surfaces, make sure your working area is not only tidy, but also clean. Take a few minutes to clear everything, put it away and wipe the surface clean. Ever have those tiny unknown bits of something that end up in fresh paint? Well, 9 times out of 10, they are residue of prior projects, specks of dried paint, etc… Making sure your area is spotless and tidy not only makes working on projects easier, creativity will also flow much better! Step Two: Now that the table is clean and clear, the next step is to gather up all the supplies needed for the project. If everything is together, there will be no more stopping and searching for a missing paint, brush, etc… As a result, without all the stops and starts, there is more continuity, and all the energy is focused on the actual project. Step Three: Step three takes a little discipline. Arrange all the paints and brushes within easy reach. I like to keep my paints in rainbow order, in hombre rows. For example, I start on the left with reds, no more than three deep, pink in front, middle red, and deeper red behind. Then next row will be shades of oranges and/or yellows, next will be greens, then blues, purples, etc… I always have blacks & whites on the far right. I also have an order for my brushes. I fold up about 3-4 layers of paper towel and lay out the brushes needed. I start on the left with script liner, then liner, rounds, filberts, flats and angles (as needed). Since I have implemented this routine, my colors and brushes are always in order and within easy access. Here comes the discipline part…setting the bottles and brushes back in their assigned places. I will admit that it takes a little while to master the routine, but what a difference it will make! I know that when I paint, I can put it in high gear and do just that…simply paint!! Step Four: Step four goes back to step one! When finished with the project, PUT EVERYTHING AWAY and CLEAN UP!! Can you hear your mom grinning?! We all know at this stage of the game that mom was always right (well, mostly)! Being organized makes painting such a treat and a pleasure! I LOVE painting, but get so frustrated when derailed with the little things. Take time to get it together and take time to keep it together! This entry was posted in Artists, Painting on November 7, 2016 by Chris. We always love when a new product hits the market that can make our creativity easier and, best of all, look better! When DecoArt released the new Ultra Fine Writer Tip, I wasn’t sure it would be all that! However, after actually using the tip, I was more than amazed. 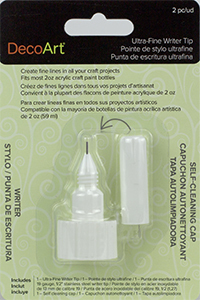 The tip is a perfect size for adding lettering, doodles, and fine lines to your projects. It fits the 2 oz Americana acrylic bottles which makes it easy to switch colors. 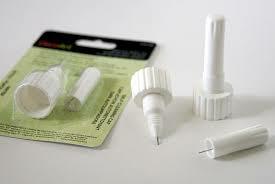 Probably my favorite feature is the self-cleaning needle cap. This prevents clogs from forming and makes it ready to use EVERY time. I know from experience, if the clean up and maintenance is tedious, no matter how wonderful, I won’t use the product very often. Because the tip is self cleaning, I know that whenever I want to use it, it will work! That in itself is genius! 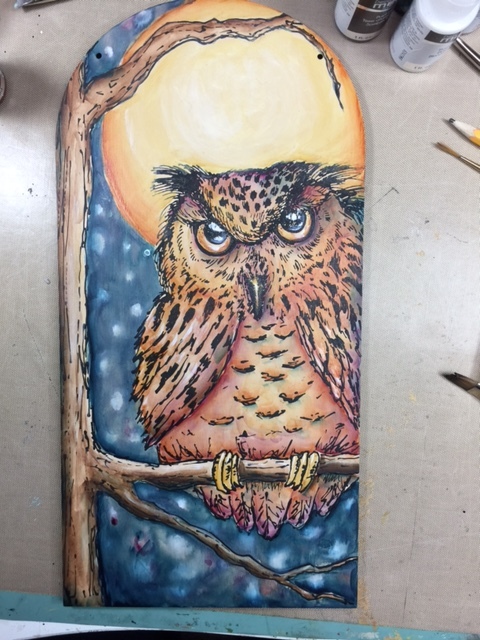 The first project I used the tip was Owl Magic. 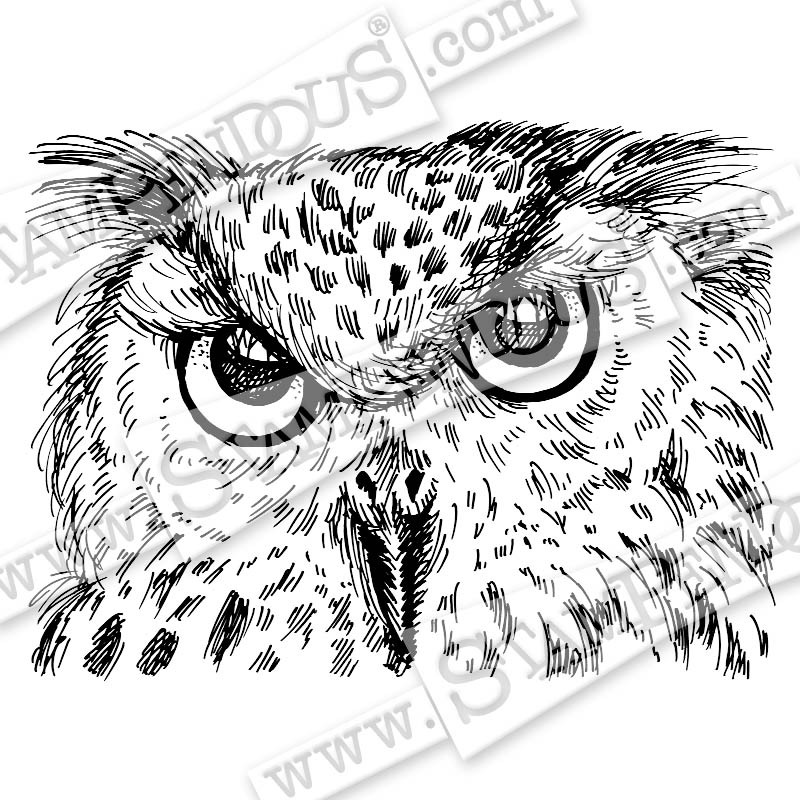 I had this fantastic owl face cling stamp, “Look Into My Eyes”, but wanted to do something more. I decided to stamp the face image using paint instead of ink and “try” the writer tip to create the rest of the body. I probably should have tested the tip before starting the project, but if you know me, I usually just jump right in and figure it out as I go! LOL, sometimes that gets me into trouble (big grin), however, the tip was so easy to use that there was no learning curve. I was thrilled as the paint flowed evenly from the tip in a nice smooth line. A few years ago I injured my thumb, so applying constant pressure was a little uncomfortable. Even though the paint flowed easily, with this big project, my thumb was not holding up! Soooo…I added a little water to the bottle to thin out the paint and…BINGO…problem solved! The paint flowed much easier and I was able to continue without discomfort. This is the first part of the design. I basecoated the background a solid color to allow the lines to be strong and visible, almost like a coloring book page. 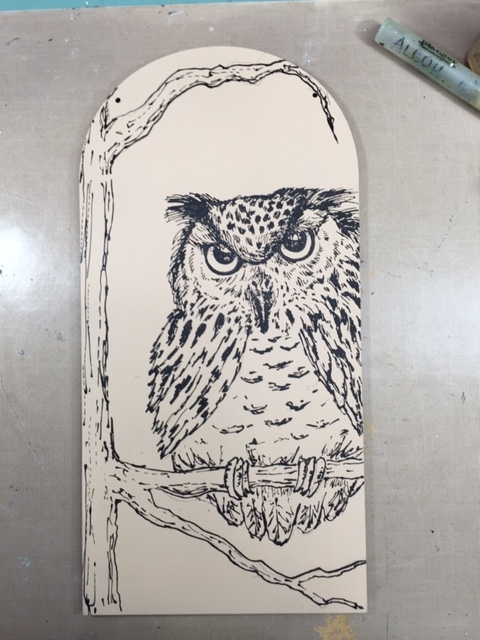 I stamped the owl face, then began “drawing” the rest of the body and adding details using the Ultra Fine Writer Tip. Even though I used acrylic paint, I approached this design as I would watercolor. I added washes and glazes of color for depth and intensity, allowing the background to glow through and create the brightness. Small amounts of paint make a big difference! The night sky and moon were added last. This way no colors overlapped and there was no need to go back to do any touch ups. A few stars and a little more linework complete the design. The tips are inexpensive so it’s very affordable to purchase several. To make my painting life a little easier, I have several tips that I have dedicated to specific colors. Because I know that I will use certain colors often, I have a tips for: Payne’s Grey, Lamp Black, Snow White and Soft Black. I have a couple extra tips for any other color I may desire. I am really not lazy, I just like to have things convenient!! I am so excited with the Ultra Fine Writer Tip . It has shed a new light on line work and taken out the difficulty of trying to obtain smooth, even lines. My mind is swimming with possibilities for using this tip. My lines look fantastic and it’s not causing any grey hairs achieving them! I would highly recommend at least one per painter…and more to make life easier! LOL! I know you will enjoy using the tips as much as I do. This entry was posted in Uncategorized on October 23, 2016 by Chris.